11.01.2018: The GRT Grasser Racing Team Lamborghini Huracán GT3 (#964, Ineichen/Ineichen/Engelhart/Bortolotti) will be starting from pole position for the 13th running of the Hankook 24H DUBAI. The GRT Grasser Racing Team Lamborghini Huracán GT3 (#964, Ineichen/Ineichen/Engelhart/Bortolotti) will be starting from pole position for the 13th running of the Hankook 24H DUBAI. 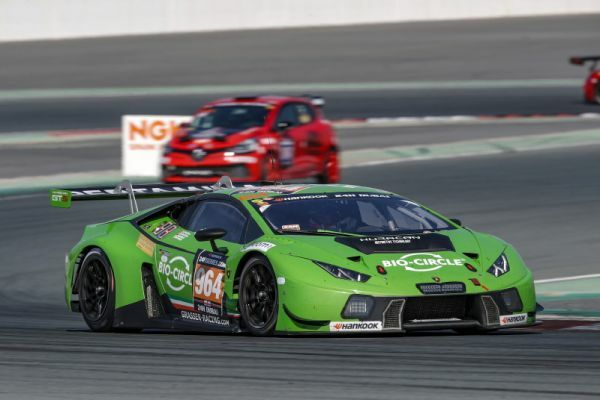 Lamborghini factory driver Mirko Bortolotti set a new qualifying record lap time of 1m56.716s around the 5.390 kilometres long Dubai Autodrome. In the 24H TCE SERIES, the Century Motorsports Ginetta (#229, Freke/Barnes/Farmer/Paul) emerged fastest with a time of 2m07.871s set by Jon Barnes. 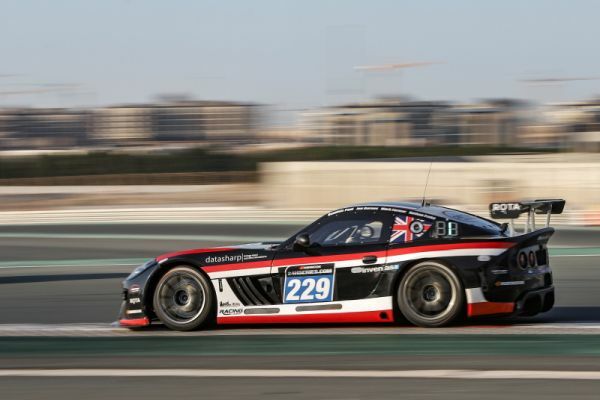 The UAE-based GP Extreme team saw Nicky Pastorelli put the fastest of its two Renault R.S. 01s (#28, Valentini/Jefferies/Pastorelli/Varutti/Kronfli) on pole position in the A6-Am class, followed by the GRT Grasser Racing Team Lamborghini (#963, Ineichen/Pampanini/Lenz/Calamia/Breukers) and the Herberth Motorsport Porsche (#911, Allemann/Bohn/Renauer/Renauer/Olsen). Behind the wheel of the #63 race:pro motorsport Porsche 991 Cup (Misky/Sultanov/Bachler/Jahn/Foster), Austrian Klaus Bachler remained on top of the 991-Pro class throughout the session, but he managed to improve his own time again and again. Eventually, he secured the class pole with 2m01.429s, followed by the FACH AUTO TECH Porsche (#62, Campbell/Andlauer/Preining/Richter) and the RScar Motorsport 911 (#82, Solovlev/Meshcheiakov/Gromov/Rusinov). With a late flyer, Swiss Philipp Frommenwiler put the #61 FACH AUTO TECH Porsche (Wagner/Bruder/Hegglin/Frommenwiler/Hirschmann) on pole in the 991-Am class. His fastest time was 2m01.633s. The race:pro motorsport Porsche (#67, Thorpe/McInerney/Quaife/Cappelli) qualified second in class, the Raceunion Porsche (#187, Autumn/Laser/Gülden/Skoog/Triller) ended up third. 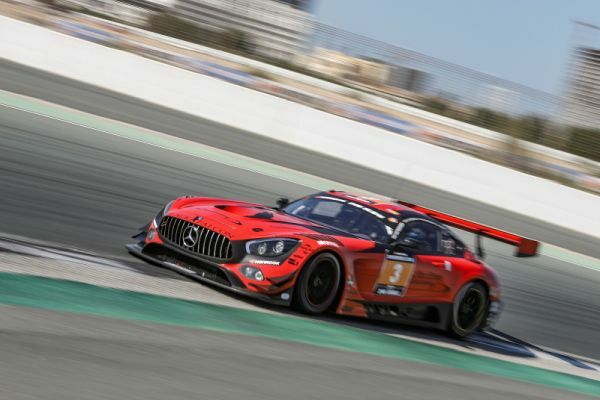 Fastest qualifier in GT4 was Philip Ellis in the Phoenix Racing Audi R8 LMS GT4 (#248, Ellis/Lappalainen/Rdest/Jasper), followed by the Besagroup Racing Mercedes-AMG GT R SP-X (#233, Kovac/Schumacher/Asch/Asch/Leib) and the Team RACE SCOUT by Winward Mercedes-AMG GT R SP-X (#84, Ward/Ward/Gebhardt/Schneider/Fontana). SPX qualifying honours went to Oliver Webb in the Leipert Motorsport Lamborghini Huracán Super Trofeo (#10, Webb/Wee/Moh/Schjerpen/Volbikas), ahead of the similar car of the GDL Racing Team Asia (#77, Liam/Farmer/Tan/Verburg) and the MRS GT Racing Porsche (#89, Rödig/Bernsteiner/Heger/Zöchling). French stalwart Christophe Bouchut put the Lamera Cup car (#60, Merafina/Couasnon/Bouchut/Marie) on top in the SP2 class, followed by the Speedlover Porsche (#78, Bastien/Diez/Rivas/Wilwert) and the KTM Motorsport Australia KTM X-BOW (#246, McMillan/Wood/Pronk/Kox). 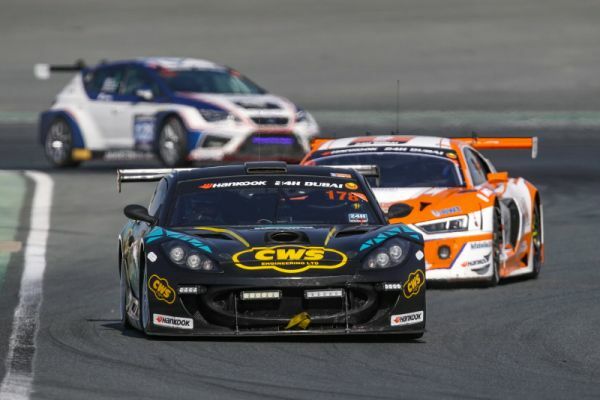 In qualifying for the 24H TCE SERIES powered by Hankook, in which the SP3, TCR, CUP1 and A2 categories took part, it was British driver Jon Barnes who topped the time sheets with a time of 2m07.871s. Thus, he put the Century Motorsports Ginetta (#229, Freke/Barnes/Farmer/Paul) on class pole position with a margin of 0.734 seconds on Bradley Liebenberg, who qualified the CWS Engineering Ginetta (#178, White/Constable/Murray/Liebenberg) second in class. TCR honours went to Belgian Vincent Radermecker, who put the AC Motorsport Audi RS3 LMS (#888, Perrin/Renneteau/Radermecker/Nitiss) into first place early in the session already and then gradually improved his personal fastest time to end up with a class-pole-winning time of 2m09.003s. The Modena Motorsport SEAT Leon TCR (#216, Shen/Shen/Tjia/Simonsen/Beche) qualified second while the Liqui Moly Team Engstler Volkswagen Golf GTi TCR (#130, Engstler/Thoma/Leuchter/Vernay) made it three different brands in the first three positions of the TCR class. There was little doubt about who would claim the CUP1 class pole as Michael Schrey put the Hofor Racing powered by Bonk Motorsport BMW M235i Racing Cup (#131, Kroll/Schrey/Fischer/Küpper/Engljähringer) into first place at an early stage in the session already and his time of 2m16.119s was never beaten. The Sorg Rennsport cars rounded out the top three with the #151 entry (Epp/Danz/Richard/Caygill/Mettler) in second and the #152 car (Gu/Fei/Beyer/Hewer/Lawrence) in third place. Danish driver Niels Nyboe was fastest in the A2 class with a time of 2m19.968s, putting the Jönsson Consulting Peugeot RCZ (#171, Jönsson/Mogensen/Nyboe/Hansen/Bruun) on class pole quite early in the session already. The Ciceley Motorsport team saw its two Renault Clios take second and third place, with the #164 car (Coates/Rettich/Hatfield/Jusjong) followed by its #162 sister entry (Morgan/Bird/Bird/Giddings). After a warm-up session from 11.00-11.30 hrs, the race will get underway tomorrow, Friday, 12 January, at 14.00 hrs. local time. The race can be followed live with timing and streaming on the series’ website. Live streaming is also available on the series’ Youtube channel and Motortrend on Demand.